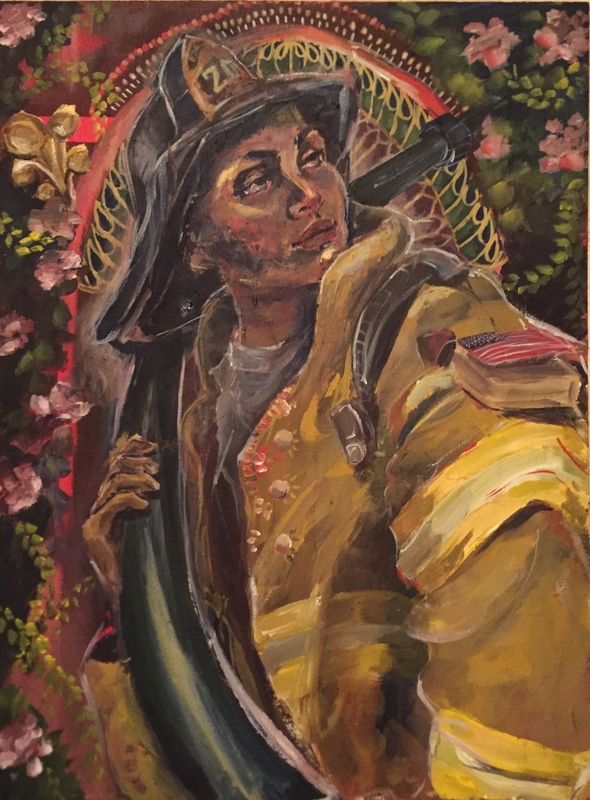 “FIRE”, an original acrylic on canvas painting by Dominique Labat, evokes the strength of firefighters. The artwork is impressionistic and embodies very traditional techniques, however, it delivers a very modern message. The woman pictured in the foreground communicates that regardless of gender or race, anyone can achieve greatness. Royal golds and burgundies are painted to emphasize the confidence and elegance that the subject beholds. This piece was honorably created especially for The African American Firefighter Museum in Los Angeles. In 2017, black woman continue to face many challenges in society. As a black female artist, I think that it is important to reenforce positive imagery and reminders of black representation everywhere. Careers, including firefighters, do not have a gender or race. The young generation of children today cannot be what they cannot see. If they don’t see people who look like them having important roles in our community, it is less likely that they’ll ambitiously want to become it. I know that art can be such a powerful outlet for visual representation, which is why this painting is so necessary and important. Dominique Labat is a Creole American artist based in Long Beach, California. Labat holds a BA in Studio Arts from California State University, Long Beach and is currently working on her teaching credentials to give back to the art community.